I have found that students enjoy and often thrive when presented with a challenging real world problem (often outside of the textbook). This can be observed during a problem based learning activity. When students come to the conclusion that their isn’t one specific right answer, they are more willing to communicate their ideas and opinions to one another. Many practical problems outside of the K-12 education realm have more than one “right” answer. When students are faced with problems that have multiple solutions the class community asks questions that often spark additional questions. Active learning often comes to fruition through these activities. In fact, the #realmath hashtag provides practical resources / images related to math found in the real world. I have provided one example of using math through art below. This idea comes for a PD opportunity that I participated in last year. 1.) Begin by showing a small section of a picture. Ask students the questions below or add your own (my questions are based on an elementary classroom). Attempt to stay away from yes or no questions as students offer their own perspectives. If you ask a yes or no question, follow it up with a why. You might want to tell the students that some of the images don’t fit like a puzzle, as some pieces were cropped at different zoom levels – this adds to the complexity of the activity. I keep a separate chart on the board to write down math vocabulary that is used during this class activity. Keep in mind that each picture is displayed one at a time, generally in a presentation format. You may want to randomly have students answer the questions below. Does this picture remind you of anything? Describe the polygons in the picture. Where are they? What type of math vocabulary can you use to describe this picture? Why is one rectangle in the picture lighter? Where/when do you think this picture was taken? 2.) Now show a small section of another portion of the picture. Follow the same guidelines as step one. Using math vocabulary, what do you see? Using fractions tell me more about this picture. Where can fractions be found in this picture? 3.) Now show another section of the picture. Follow the same guidelines as step one. How does this picture similar to the first picture? Why are some of the flags horizontal? What type of information do you think the builders needed to construct this building? How tall do you think this building is? Why? Do you think the building in the very front of this picture is the tallest? Why? What direction do you think the sun is shining? Why? What part of the picture do you think is missing? Where do you think this picture was taken? How accurate were your initial predictions? What are the differences/similarities between pictures one, two, three and four? What additional math terms can you use to describe items in this picture? What materials would you need to construct a building like the one in the picture? Why is there a reflection on the building on the right? How could you estimate the height of the building in the center of this picture? Optional -Reflect on today’s activity in your journal. Describe your reaction and what you learned during this activity. Optional – Similar to this example, students could take pictures around the school and create their own presentations on finding math in art. Students could be given a rubric and work in collaborative groups and present their findings to the class. Of course feel free to modify or change any of the steps above to meet the needs of your specific students. My example is only a general template. I’ve used this in elementary classrooms to introduce specific topics. You could use a variety of images for this project, or have students create / take pictures on their own. 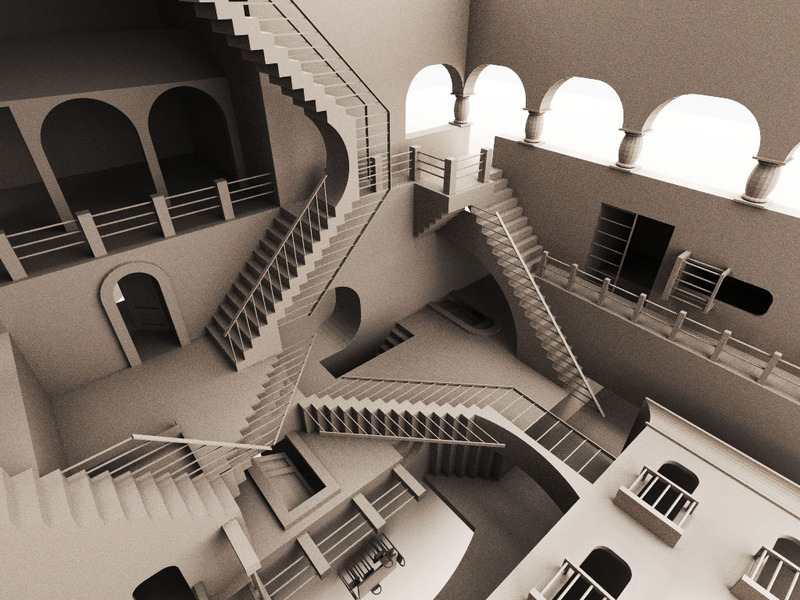 What about using Escher’s artwork below? As you can see, there are a lot of possibilities. ‹ PreviousFeedback … from students? I think your idea is really good, and definitely worth trying out. I wonder if you could, as a follow-up activity, have your students create their own version of this “picture story”? I believe a follow-up activity would be beneficial. After modeling the first activity, students could create their own projects and demonstrate learning in the process. I picture students presenting their projects to the class in a variety of formats.